It is one week till Christmas and the mad rush is on. It was one of those mornings when I wasn’t sure what to write about. I know, amazing, right? Then I listened to “Minute with Maxwell” on LIMITS! The definition of LIMIT is a restriction on the size or amount of something permissible or possible. There are limits for our own protection – like speed limits. Restrictions can help to keep us safe from the world around us. We limit our kids when they are growing up to protect them as they learn to set their own boundaries. As adults though, do our LIMITS prohibit us from stepping out of our comfort zones? Do we LIMIT ourselves in our dreams, when setting goals and as a result LIMIT our potential to achieve all of the blessings God has in store for us? At the end of John Maxwell’s video, he issued a challenge – share this word with someone and ask THEM if they have placed LIMITS on themselves they need to lift? WOW! This was something I needed to hear this morning. I dream big, set goals and share them with all who will listen (or who are reading my blog). Honestly, internally, I place LIMITS on things. I allow Doubtfully Debbie and Negative Nellie to hang on the edges of my dreams just waiting for the chance to find a crack in the door so they can enter. I LIMIT myself without even realizing it sometimes when I hesitate and wonder “what will people think”. I LIMIT myself when I give Doubtful Debbie even a moment of consideration before doing something. My self imposed limits may have kept me from reaching my goal weight or recruiting new team members or event growing my business – not allowing myself to reach my full potential. I know this is ALOT to think about with Christmas just around the corner BUT this may be the perfect time. Many will be setting New Year’s Resolutions over the next two weeks. Will your resolution be limited or will you let yourself dream big stretching your limits? What are your limits? Are they self-imposed to keep you from reaching YOUR full potential? Does your self-imposed limit keep you in your comfort zone? My challenge to you today is to FIRST, listen to Minute with Maxwell. I take one minute ever morning to hear his motivating words which sets the tone for the day. SECOND, identify YOUR self-imposed limits and work on lifting them so you can reach YOUR full potential. 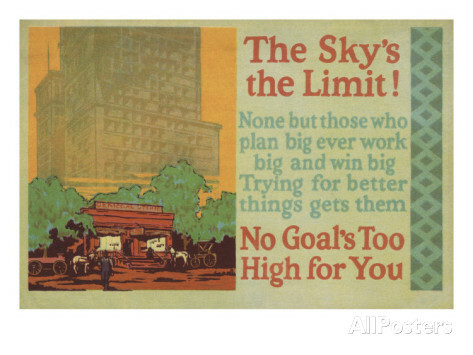 The “Sky’s the Limit” reminds you: “Nothing will be impossible for you!” So, shoot for the stars! If you fall, you’ll land on a cloud! I would love to hear your thoughts on the word “LIMITS”.